Even though Gemini is filmed in the lush an sophisticated style of William Winding Rfen’s film: Neon Demon, and Tom Ford’s: Nocturnal Creatures. Aaron Katz attempts to give us the necessary narrative substance to reel us in unlike those films which leaned heavily on style, over substance. Having so many celebrities on social media these days may demystify Hollywood, but it’s still a dark environment that serves as the perfect stage for a neo-noir murder mystery. In Gemini, Lola Kirke stars as Jill LeBeau, the personal assistant and best friend of Zoë Kravitz’s in-demand starlet, Heather Anderson. Heather is burning out on the life, and feeling increasingly paranoid about her safety, as obsessive fans and abrasive colleagues seem to close in on her. After a terrible crime is committed, Jill becomes both the primary suspect and the person best positioned to solve it. But she’ll have to evade the law to make that happen. In the clip above, Jill is at the end of a long day of fighting Heather’s battles when a too eager fan of the star interrupts their dinner. She bears an uncanny resemblance to Heather, and immediately feels too comfortable invading her personal boundaries. The crime tests the complex relationship between a tenacious personal assistant (Lola Kirke – MISTRESS AMERICA, MOZART IN THE JUNGLE, GONE GIRL) and her Hollywood starlet boss (Zoë Kravitz – MAD MAX: FURY ROAD, DIVERGENT, Big Little Lies). As the assistant travels across Los Angeles to unravel the mystery, she must stay one step ahead of a determined policeman (John Cho – STAR TREK, HAROLD & KUMAR GO TO WHITE CASTLE) and confront her own understanding of friendship, truth, and celebrity. This cinematic experience is a worthy one, thanks to great work from director of photography Andrew Reed. GADZOOKS!!! Holy Hell what do we have here? A hetero sexually tinged homage to David Lynch’s Mulholland Drive? Heather, played by Zoe Kravitz, is a stunning starlet, who, at the time of the phone call, is supposed to be inside an Italian restaurant that specializes in “apps” (mozzarella sticks, not Angry Birds), going over a role with the film’s cynical director, Greg (Nelson Franklin). But Heather has a change of heart. She’s had enough of Hollywood for a while. She wants to escape. 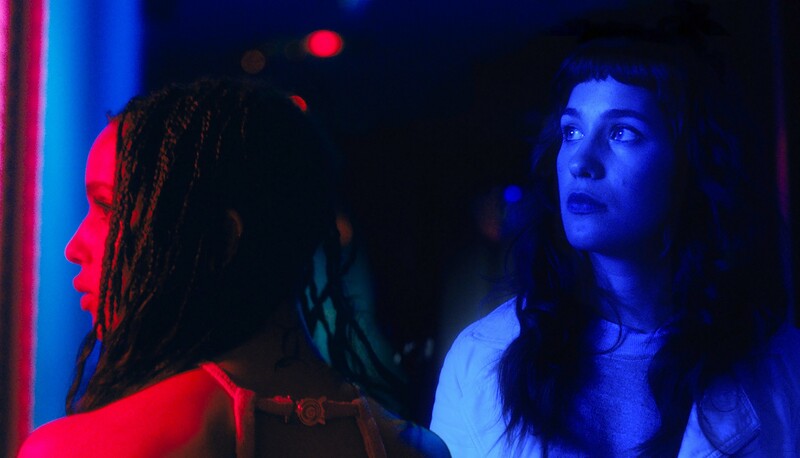 She’s quitting the film — OK that’s not totally right: Heather, like the good femme fatale she is, has Jill (Lola Kirke), her close friend and personal assistant, quit the film for her. As Jill followsHeather into the night, the danger slowly mounting and the clues and suspects accumulating. A superfan gets too close. So does a paparazzi (James Ransone). Heather acquires a gun. They meet up with Tracy (Greta Lee), Heather’s new love interest, for drunken karaoke. After the long night out, Heather and Jill crash at Heather’s place, and a motion detector light goes off outside. Without giving away precisely what happens and when, suffice it to say that Jill, whose surname is LeBeau, is the primary suspect, and she must solve the whodunnit while eluding the police. It’s a “Fugitive”-like plot, but the way the character slips around the sprawling city is more like Philip Marlowe than Richard Kimble: She has her head simultaneously in the clouds and on the case. And yet, though there’s a Marlowian quality to her, it’s faint; really, it’s tough to find an adequate comparison for Jill LeBeau. Women don’t often get to play protagonists of Bechdel-breaking genre pictures, especially not ones that neglect to flaunt their progressivism. The only radical quality about Jill is her normalcy. She’s responsible enough to show up for appointments on time. And she’s clever enough to put the pieces of the case together. We’re told she has a strong memory, too. But she wouldn’t win any superlative contests. She lacks Clarice Starling’s tenacity, Lisbeth Salander’s genius. And her memory may be good, but she’s no Cam Jansen. That’s the point: Normal women, like Jill LeBeau, can navigate extraordinary circumstances just as well as normal men.